It always feels like it’s been a while since we’ve been to a proper little coffee shop, it doesn’t seem like we’ve been to many on this trip. We found this little gem whist walking around yesterday and vouched we’d come here this morning. What caught our attention was what was written on the window. It was basically their story on how how they’ve travelled the world for the best coffee and they want to share their passion with us. 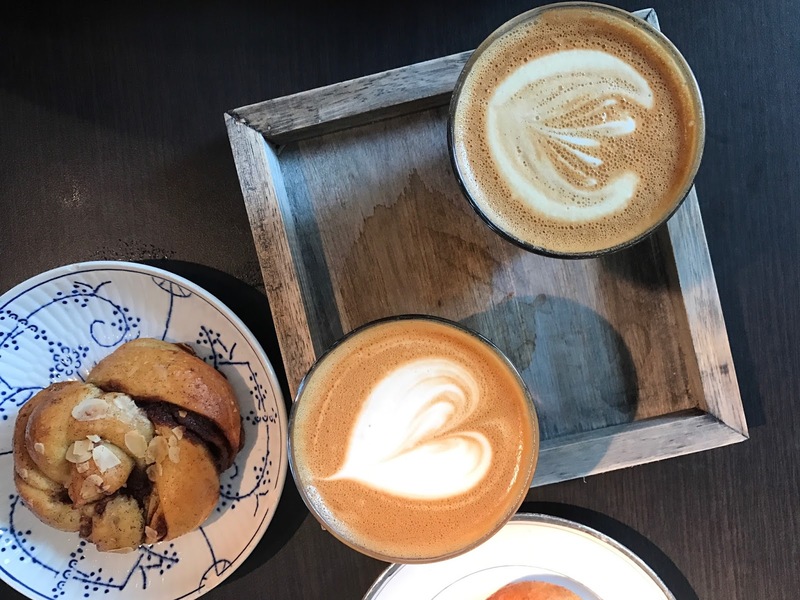 Of course as coffee lovers, we were completely drawn to this and wanted to find out more. It was cosy inside, filled with tourists and locals, some on their laptops like it’s their daily routine, while others got their coffee to go. The coffee was a delight and paired with our chosen cinnamon swirl. We’d defiently recommend this place if you’re in need of a pit stop. Lunch was completely spontaneous and not all to exciting if i’m honest. We passed it on the way to the Comic Strip Centre and agreed on coming back. What caught us was their cheap prices and that’s exactly what we were looking for. With any choices of what type and flavour pasta you’d like, to the portion size and even able to make a meal deal of of it. The pasta was homemade and fresh. The medium box first impression was it was too small, but it definitely filled us both up, along with James’ healthy option of an apple and my super soft and delicious white chocolate cookie. Dinner came along late, majority of the afternoon it was pouring down and we just didn’t want to walk around getting wet, so once we waited for it to settle it was already late. We headed down right into the centre where many restaurants are lined up, but we knew exactly where we were going. 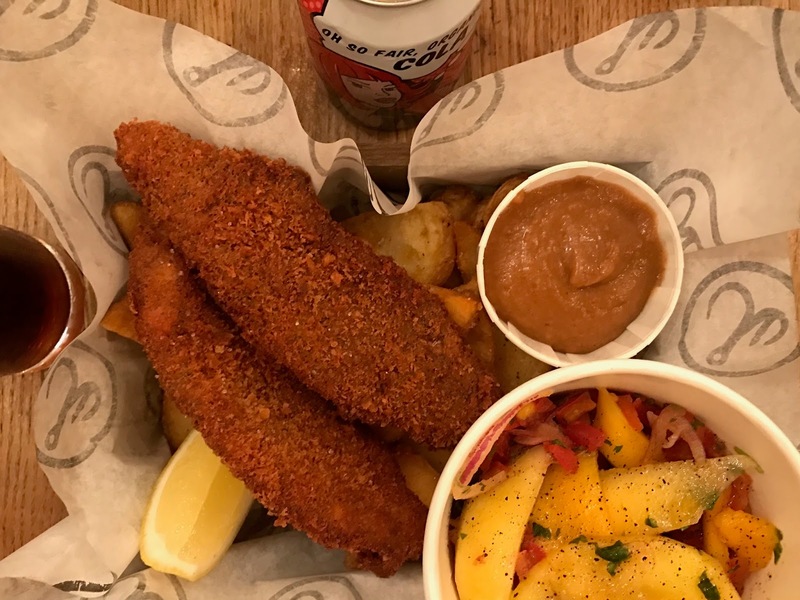 You know when you just crave fish and chips? That’s what I wanted, but little did I know my choice was going to be changed when Jame pointed out that they had a special up: Filipino Adobo Panko and mango salad with spicy banana ketchup. If you didn’t;t already know, I, Jessica am Filipino and I never tend to eat Filipino food outside of my own house. Why? Because nothing beats my grandmas cooking. Simple. 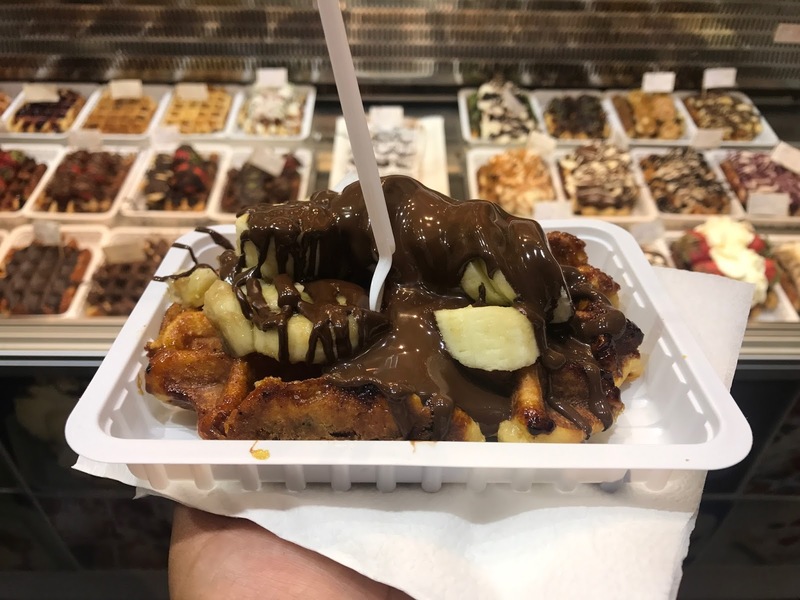 Due to having late dinner, we once again missed the Waffle Factory (we should obviously check the closing times) but we were adamant on getting a Belgian waffle tonight and typically there were many little open stores still in business at this time of night – so we picked the closest one and got the banana and nutella waffle. 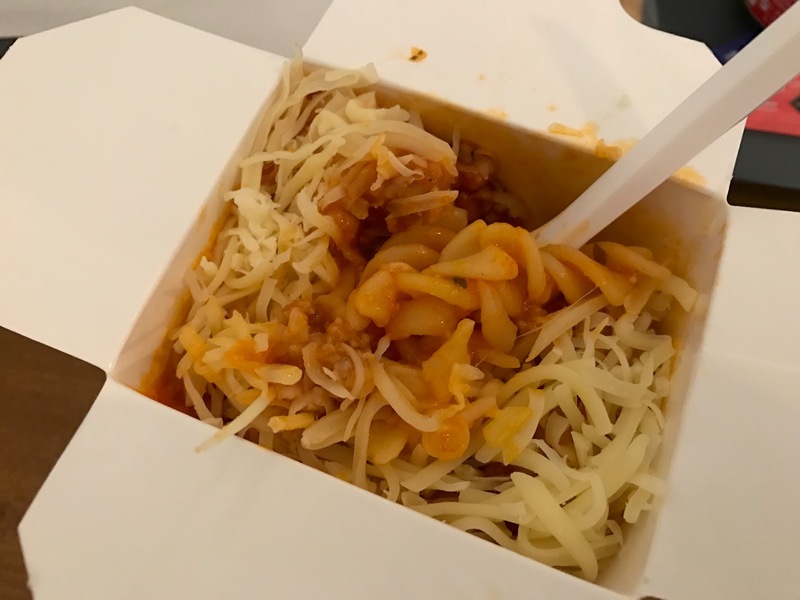 Cup Pasta looks amazing, I wish they had something like that where I live. Like a Pick N Mix pasta cafe!